SCS place great emphasis on all aspects of health and safety both in ensuring the safety of our staff and also ensuring the safety of our clients premises. 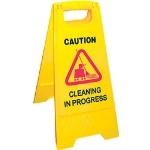 Our health and safety procedures are well documented and include a Health and Safety Policy, generic and site specific method/risk assessments for both specified cleaning activities and the Control of Substances Hazardous to Health (COSHH). We operate a colour coding system for all clothes and mops and our machinery is reguarly checked to confirm that it complies with the Electricity at Work Regulations and is PAT tested reguarly. Our staff receive an induction at the commencement of their employment which includes basic training in the aspects of Health and Safety and COSHH that is applicable to their job. This training becomes more detailed for certain types of contract where specific risks have been identified. As a company SCS Cleaning Services will always seek to use environmentally firendly products at all times. CRB (Criminal Records Bureau helps employers in the public, private and voluntary sectors identify candidates who may be unsuitable for certain work, especially those involving contact with children or other vulnerable members of society. SCS are registered for disclosure with the CRB to vet the suitability of its staff for any such position. SCS recently underwent the process of having it's safe working procedures assessed by National Britannia and have been certified as a Safe Contractor. "More companies need to understand the importance of adopting good risk management in the way that SCS has done." "SCS's high standard has set an example, which hopefully will be followed by other companies within the sector".